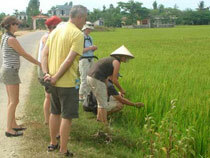 Covering North to South Vietnam in only ten days, this journey promises thousands of delights and welcoming smiles. 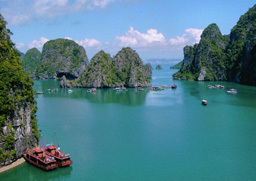 This tour focuses on discovering the essence of Vietnam’s cultural and natural beauty, especially its three World Heritage Sites recognized by UNESCO: Halong Bay, Hue and Hoi An. 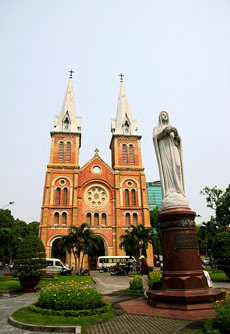 A full day spent touring Hanoi, the political, economic and cultural capital of Vietnam. Starting with the Museum of Ethnology (closed on Mondays), which offers informative and well-documented information on the country’s 54 ethnic groups, including elaborate and colorful hill-tribe costumes. The display continues in the outside garden with fascinating examples of traditional houses from the Kinh’s to the ethnic groups of the Central Highlands. 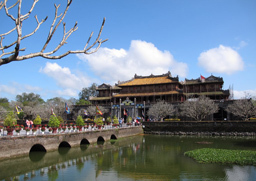 You will then visit the Temple of Literature, a temple built in honor of Confucius in 1070, and served as the first Royal National University in Vietnam founded in 1076. 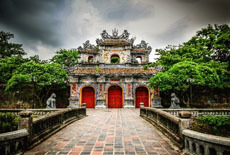 This temple and its beautiful garden provide an opportunity to learn more about the Mandarin education that has shaped Vietnam for 1000 years and to relax in this tranquil setting. 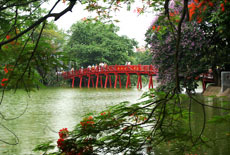 The afternoon is spent exploring the alleys of Hanoi’s Old Quarter, visit HoanKiem Lake and Ngoc Son Temple or the Jade Mountain Temple situated in the heart of Hanoi. A delightful water puppet show will perfectly wrap up your day. Overnight at hotel. After breakfast, you depart to Halong Bay, passing beautiful scenery along the way full of lush rice paddies and winding rivers, typical of the Red River Delta. 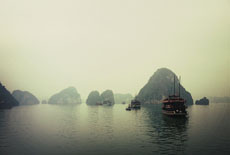 You will arrive at Halong’s tourist wharf around noon and embark a classic wooden junk. Lunch will be served as the boat gently cruises past numerous islands and limestone structures rising from the emerald waters of the bay. It is also an ideal opportunity to enjoy the sea breeze and refresh your soul. An experienced chef will prepare a fresh seafood dinner. Overnight on board in your private cabin. Start your day with a leisurely boat trip on the poetic Perfume River. Stop en route to visit the iconic Thien Mu Pagoda also known as “Heavenly Lady Pagoda”, the symbol of Hue, and Minh Mang Mausoleum, one of Hue's finest royal tombs. An architectural complex compromised of 40 buildings (palaces, temples, pavilions, etc.). The afternoon will be spent visiting Hue Imperial City, the last royal city of Vietnam with three ramparts and various beautiful structures including the Flag Tower, Ngo Mon Gate, Nine Dynastic Urns, Nine Holy Cannons, Thai Hoa Palace and the Forbidden Purple City or Tu Cam Thanh. You then visit the Tomb of Emperor Tu Duc, which was built between 1864 and 1867 by 3000 soldiers and workers. It includes 50 monuments surrounded by a 1500m long wall and covers an area of 12 hectare.Overnight at hotel. 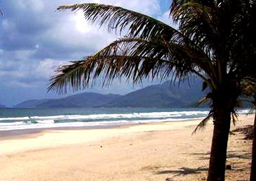 Morning drive on the Mandarin road, a scenic journey from Hue to Hoi An, which allows you to see a picturesque Vietnam with stunning beaches and lush tropical forest. En route visit the Museum of Cham Sculptures, with its many precious antique artifacts of the former Cham Kingdom on display. You then continue our drive to Hoi An’s ancient town, once an important international trading port and now a charming riverside town. 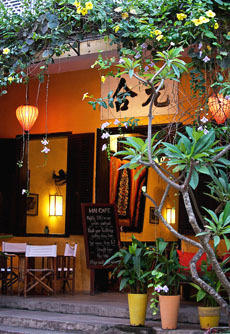 Hoi An features a fantastic combination of Chinese, Dutch, Japanese and Portuguese culture. 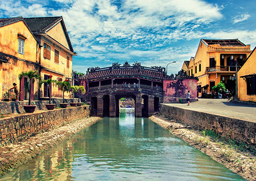 Explores each, when visiting the Japanese Pagoda Bridge, Chinese streets, old Phung Hung houses, Hoi An’s market and ancient port, Phuc Kien assembly hall. On the 1st and 15th of every lunar month, Hoi An’s ancient town is lit up by hundreds of colorful lanterns, giving it an extra portion of sparkle. Enjoy the city’s transformation and stroll through this quaint, glowing fairytale town in your free time. Overnight at hotel. Morning transfer to Danang airport for flights to Ho Chi Minh City, formerly known as Saigon or "Pearl of the Far East". 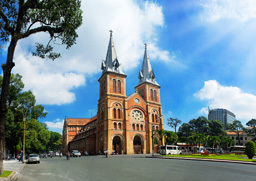 You will spend a day visiting the city situated on the banks of the Saigon River, famous for its wide elegant boulevards and historic French colonial buildings. The must-visit list includes: Ton DucThang and Nguyen Hue Avenue, the Reunification Palace or Presidential Palace, Notre Dame Cathedral built in 1877 and the Central Post Office. The tour concludes with a visit to and optional shopping spree at Ben Thanh Market, the busiest business centre in Ho Chi Minh City. Overnight at hotel. 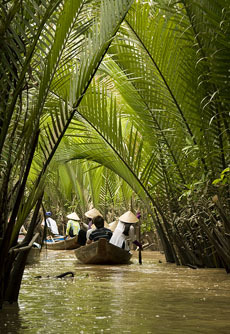 Leaving the bustling city of Saigon behind, you will depart to the Mekong Delta considered Vietnam’s biggest rice basket. You will arrive at Hung Vuong Pier in Ben Tre and embark our boat to cruise along Ben Tre River, a tributary of the great Mekong, to explore the local lifestyle and the daily hustle and bustle. You will stop at the brickfield belonging to Mr. Tu Lo to see how bricks are made by hand in Vietnam and a coconut candy home factory located along the canal to witness the process of making this local candy and other souvenirs. 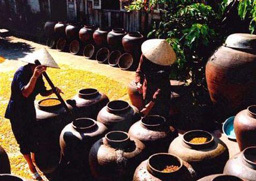 You will then have the opportunity to taste bee honey tea at a local honey farm and a variety of tropical fruit that grow amply in the orchards of the Mekong Delta. You can then walk or cycle through the coconut groves and green rice paddies to soak up the atmosphere and relax in the tranquil countryside. 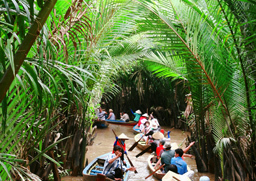 The afternoon begins with a trip on small rowing boats through a maze of waterways shaded by two rows of palm trees. You then cruise back to the pier and disembark. Transfer to Can Tho. Overnight in Can Tho. 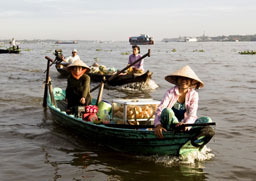 Take an early morning boat trip through the winding waterways of Cai Rang floating market, the biggest and busiest floating market in the Mekong Delta. This is the best time to visit the market, as it is crowded with hundreds of sampans that offer fruit, vegetables, plants, food and other goods for trade. This is the perfect opportunity to take photos, communicate with locals and taste fresh tropical fruit. 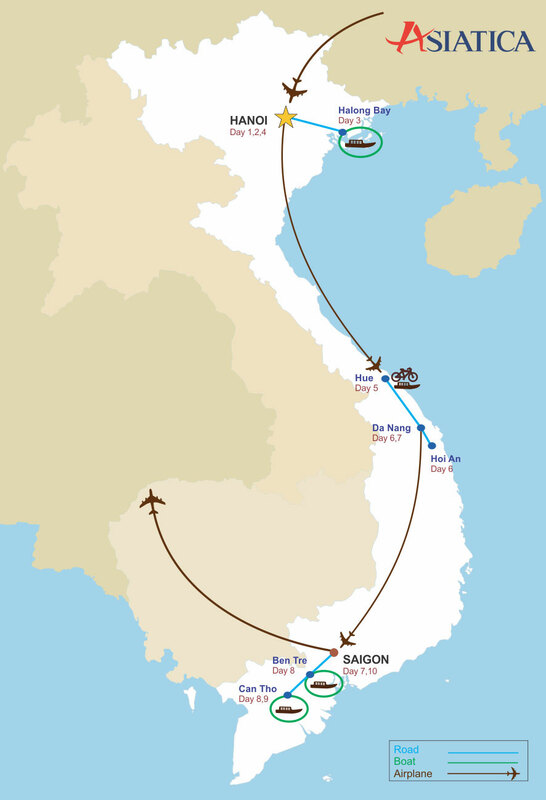 Leave the market, and return to Saigon. On the way back, we will stop at an old BinhThuy house 5kms from Can Tho city and Long Dinh mat weaving village where you witness the making of a mat, a very popular item closely associated with Vietnamese culture. Overnight at hotel in Ho Chi Minh City.